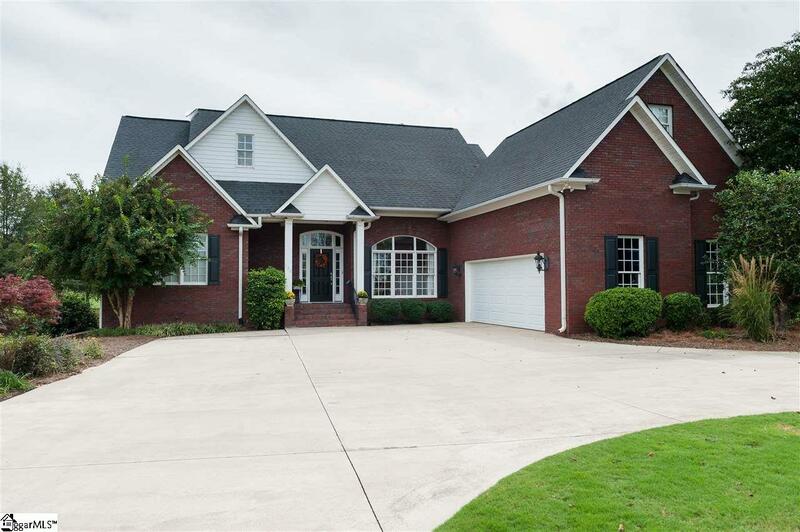 On the golf course in Woodfin Ridge - 0.78 acre lot with trees bordering the golf course surrounds this custom designed home.The circular driveway and additional parking space is perfect for the growing family! Everyone will enjoy the greatroom with windows offering views of the course, a gas log fireplace, and custom built-ins. The kitchen has solid surface counter-tops, updated stainless steel appliances, and large eating area overlooking the course. Hardwood floors have been recently refinished throughout the main living areas.The bonus room offers the perfect venue for watching a ball game or a movie. The media equipment and chairs will stay with the home. The master suite is on the main level with many windows offering bright and cheerful lighting, views of the large yard and course plus a luxury bath. The jetted tub, separate shower, double vanity, and his/her closets is bound to please. Upstairs you will find guest rooms and a guest bath. In the walk-out basement you will find a large rec. room, exercise or office area, and a guest bedroom and full bath. New flooring and HVAC in the basement were installed in 9/2018. Enjoy grilling out on the deck or patio areas. The yard offers plenty of space to add a pool. The crawl spaces (2) will allow room to store a golf cart, lawn equipment, etc. The home is plumbed for central vaccume, has an alarm system, and irrigation system.